The north west highlands of Scotland once offered the best sea trout fishing in the world. Fishermen would come from all corners of the globe to drift in an open boat on wild lochs like Maree, Stack, More, Shiel, Hope and Eilt, or to fish through the short summer nights on the rivers connecting the lochs to the sea, just for the chance of a shining sea trout fresh from the Atlantic. Alas, the sea trout stocks have been decimated in recent decades, though some fishermen still come, unable to resist the enduring appeal of the north west highlands, with its once pristine sea lochs, until very recently unsullied by the hand of industry. It is to be hoped that the powers that be will realise what has been lost.... before it is too late. The map below shows the main sea trout rivers and lochs on the northern Scottish mainland, in the north highland counties of Caithness, Sutherland, Ross and Cromarty, Argyll and Inverness. 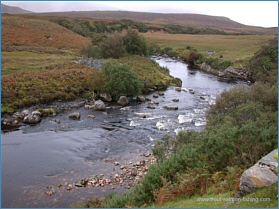 Clicking on a green dot will take you to a page showing detailed maps of each river and information on the sea trout fishing available on the rivers and lochs in the north of Scotland. 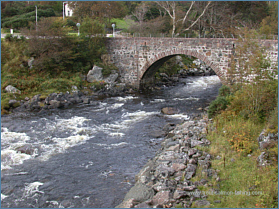 For more information on the sea trout fishing available on the rivers and lochs of the North of Scotland, including detailed maps, please select a sea trout river or loch by clicking on a green dot on the map or on a river name in the list to the right of the map.